alternative for research labs, K-12, University, Charter School and commercial laboratories worldwide. Greenstone Classic Tops are now provided with no less than 10% recycled, post consumer content (by weight) of crushed glass material and when added to the existing but modified formulation of laboratory epoxy resin and other inert fillers, the Greenstone countertop maintains its high performance ratings for chemical and stain resistance, along with resistance to high heat conditions in working labs, residential kitchens, food courts and other environments. The material is indeed eco-friendly and eco-responsible and made by Durcon, Inc of Taylor Texas. 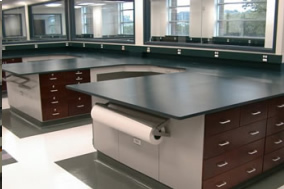 Greenstone, LEED quality epoxy rersin lab work surfaces, is a modified engineered stone, and tested under ASTM standard E595-06 and specified in Section 01 6116 for performance requirements and VOC properties. The result is a resoundingly positive 0.011% by weight. Many products we encounter in our work environment or homes release or "off-gas" VOCs. Some examples of sources of VOCs are building materials such as Carpets and adhesives; Composite wood products; Paints; Sealing caulks; Solvents and Fabrics. Greenstone offers low VOC off-gasing at: 0.238 mg/(mm^3) or 238 g/l or 0.238 mg/m3. Durcon Greenstone is quickly becoming the choice of architects, consultants and end-users, to contribute to that endeavor. our residence or other facilities where people gather or perform work services. Durability and design flexibility continue to make this next generation of the Durcon GREEN epoxy countertops more environmentally eco-friendly and contribute to health, safety and life standards. products as it was proven to be a certification candidate to contribute to LEED points after submittal to the US Green Building Council as a component part of an overall project, per the LEED rating system. Commercial buildings, as defined by standard building codes, are eligible for certification under LEED for New Construction, LEED for Existing Buildings, LEED for Commercial Interiors, LEED for Retail, LEED for Schools. Building types include - but are not limited to - offices, retail and service establishments, institutional buildings (e.g., libraries, schools, museums and religious institutions), hotels and residential buildings of four or more habitable stories. or will use LEED to help transform the built environment to sustainability. State and local governments across the country are adopting LEED for public-owned and public-funded buildings. There are LEED initiatives in federal agencies, including the Departments of Defense, Agriculture, Energy, and State; and LEED projects are in progress in 41 different countries, including Canada, Brazil, Mexico and India. 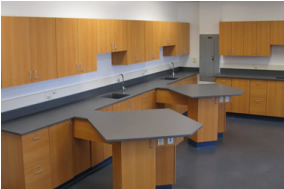 Like our Standard Classic Duratop Epoxy Countertops, Greenstone work surfaces are produced by Durcon in a range of colors for the categories of countertops, pegboards, reagent shelving, sinks, fume hood bases, cupsinks and some accessory. 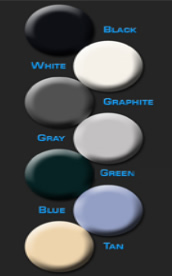 The colors include Black Onyx, regular gray, tan, bright white, graphite gray, and a new assortment of colors recently introduced. 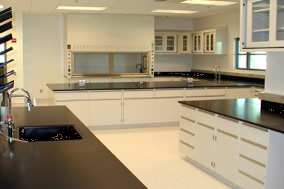 Unlike granite or other stone products, GREENSTONE Epoxy resin or our standard classic DURATOP epoxy resin countertops are monolithic cast materials and are homogenous with color and properties locked in, requiring no surface treatment or other extensive sealing or coatings. Compare and contrast to other materials in the marketplace. 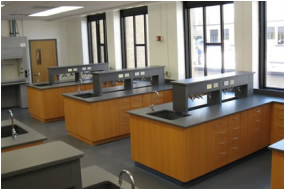 Duratop Epoxy and Greenstone Epoxy are economical of cost, non-corrosive, will not burn and are self-extinguishing, non-porous / non-absorbent and remain chemical resistant to harsh environments in wet laboratories. Greenstone is the choice for an environmentally friendly countertop and work surface.